It is a tale as old as time. You write the perfect lesson, make the necessary copies, prepare for a good class and things go awry. You fail to have enough time to finish the lesson. You are rushing to cover all of the content you had prepared and get caught up having to do basic logistical things like assigning homework, collecting homework, and ensuring students are prepared to start the lesson. 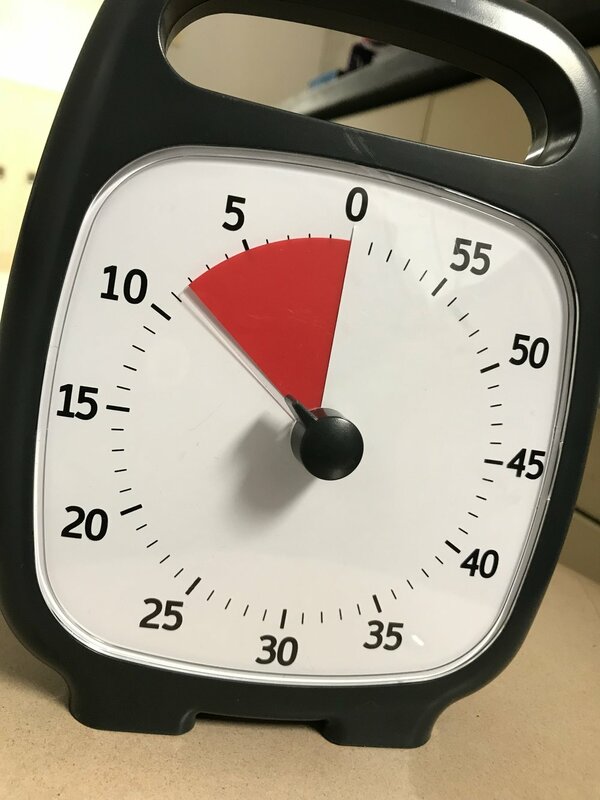 What if I told you there is a way to ensure that time is not wasted and you can effectively ensure students handle logistical things prior to the lesson beginning? A lot of the distractions and disruptive behaviors that occur in class happen within the first five minutes of class. I have introduced Take 5 into my classroom to curb those distractions. Every day, there is a list of items for students to complete at the beginning of class within 5 minutes. The goal is to ensure that students have handled all logistical things and are ready to sit down and begin the lesson when the five minutes has ended. It also helps to ensure students are being proactive in the assigned tasks, rather than chatting or waiting until the last minute to submit homework, sharpen pencils, etc. 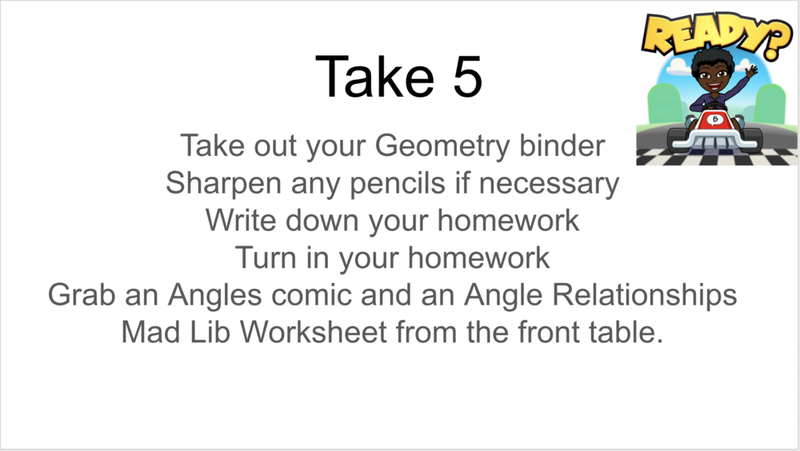 The Take 5 list should always include: sharpening pencils, turning in homework, and gathering any papers/binders needed to start the lesson. It is also important to ensure students write down the homework for the day. They are writing it down with the intent for you to complete the lesson for the day. This item may seem obvious, but I have been into countless classrooms that have no agenda posted. There is a spot on my board for the agenda each day because I teach Geometry all day long. If you teach multiple different classes a day, you can easily add different agendas to powerpoint presentations that are posted with the Take 5 at the beginning of class. A daily agenda has many benefits. It allows students to know the schedule for the class, which eliminates questions like "What are we doing today?" It also teaches students time management because it forces the teacher to adhere to the designated times for each component of the lesson for the day. It is important to review the agenda (after reviewing your daily objective) so that students have an idea of what to expect during class. When you are writing your agenda, you should make sure to break down each component of class into small chunks of time (no more than 20 minutes). Students can be easily distracted in class because they feel as if the class is dragging along with no end in sight. Breaking down your lesson into smaller chunks of time helps give the illusion that we are moving through the lesson at a fairly quick pace. In order to ensure you are keeping track of time on your agenda, get a timer! My Time Timer was one of the best investments I could have ever made. A timer helps to keep you on task, but it also allows students to know how much time they are allotted before moving on to the next activity. A timer helps teach time management. When I added a timer to my classroom (in addition to my agenda) it helped cut down wasted time and I was able to complete some of the times on my agenda before the time was up. This allotted me more time for student questions or discussion. The Time Timer in my classroom. Order your own Time Timer here! Always have a place where students can easily turn in their homework each day. Students should not have to guess where it must be submitted. A homework bin/folder during Take 5 helps prevent any loss of class time. Students are responsible for turning in their work in the first five minutes of class. To help distinguish between my different periods, I have my folders color coded. 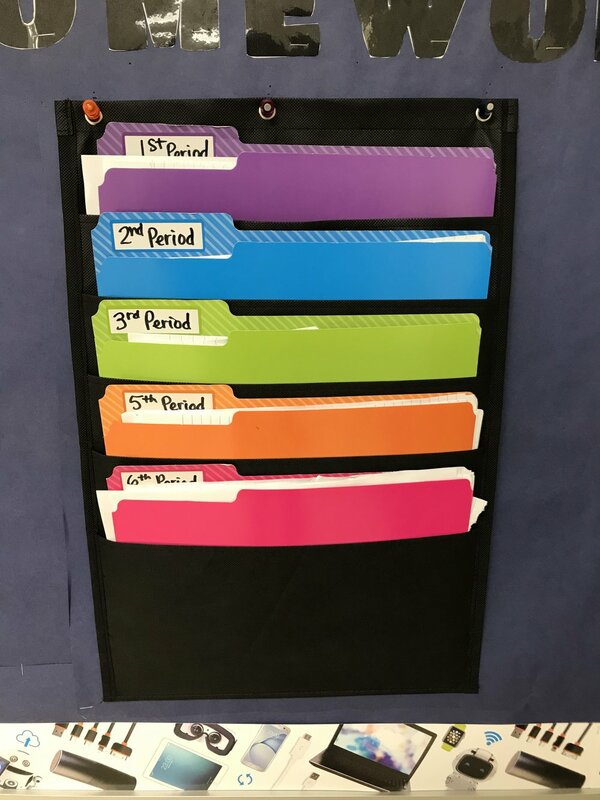 Students know which folder to put their homework in based on the color and label. Order your own hanging file folders here! When I first came across the "What Did I Miss" binder, I thought it was the perfect way to ensure students obtain any missing homework or worksheets needed when absent. I noticed the issue of students obtaining missing homework, but needing to get the notes from the lesson from their peers. I decided to add another component to the binder. For every lesson, I attach a copy of my handwritten notes for the day. Students who are absent are allowed to take those notes and copy them down on their own and put them back into the binder. This saves the headache of students have to borrow notes from another student who may need them for the current lesson. It also eliminates students asking for any missed work or notes when they immediately know to check the binder.